In our modern times, January seems to have become a time for abstinence, like an early Lent. Cutting down, cutting out, giving up. Yet, traditionally, the Christmas celebration reached its climax today, 6th January, Epiphany in the Christian calendar, probably borrowed from some earlier, pre-Christian celebration. Whatever the beliefs, it’s a dark time of the year: almost exactly the middle of winter, everything from the last year has died off and few if any signs of life are poking through. Today, early January signals the time of year when most people feel depressed (back to work after all the festivities and the realisation after a week-long promise of new resolutions, that much will be the same); in latter days, the feeling would have been the same but for more fundamental reasons: when will growth return? Will we be able to replenish our stocks of food? Will we – and our livestock – survive the harsh winter. Out of this fear, the pastime of wassailing grew. Nowadays we think of it with cider and apple trees, but more widely (given the relatively restricted growth of apple orchards across the isles), the wassail was a lammas or spiced ale (unhopped beer). I knew an old farmer who strained mulled wine through lambswool – perhaps this filtering process is the source of the word. Whichever drink was made, apple trees would be blessed; field boundaries would be walked, a drop of two of the mulled drink would be imbibed from large hand-turned bowls. The cry of ‘Was hail?’ would be ring out; the reply, ‘Drink hail!‘. Hopefully the spirits of the trees and the plants would be involved and renewed growth would follow. 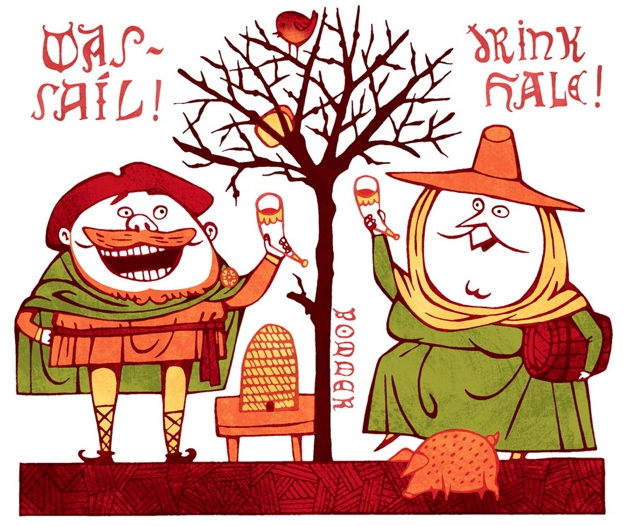 With the wassailing bowl we’ll drink unto thee.